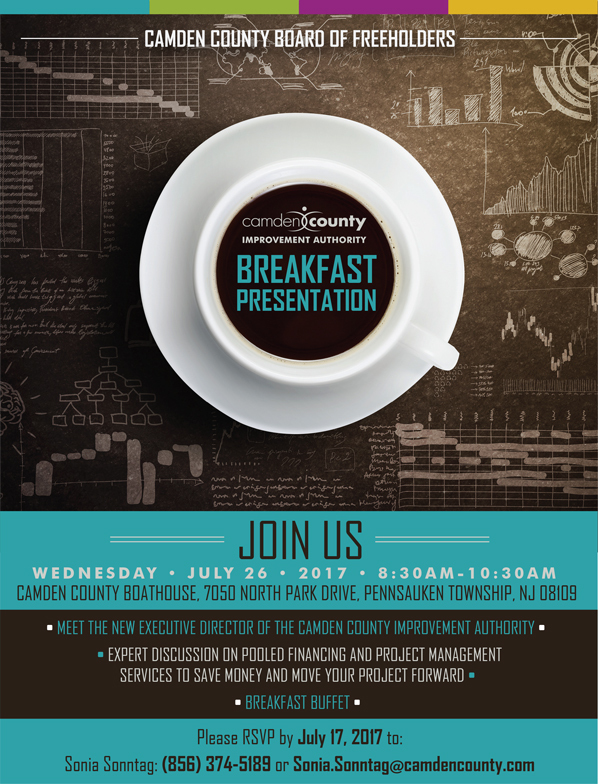 Mayors, Commissioners, Administrators, and Municipal Financial Officers are invited to join us on Wednesday, July 26th from 8:30 AM – 10:30 AM at the Camden County Boathouse for a Breakfast Presentation by the Camden County Improvement Authority. Meet the new Executive Director of the Authority and participate in an expert discussion on Pooled financing and project management services to save money and move your project forward. RSVP for the presentation and breakfast buffet by July 17th to Sonia Sonntag at sonia.sonntag@camdencounty.com or call 856-374-5189. This event is presented by the Camden County Board of Freeholders.